In 2012, the EAH Housing Eviction fraud scandal sent shockwaves throughout the San Francisco Bay Area and stirred up a hornet’s next exposing a huge corruption circuit which exposed several judges beginning with Judge Socrates Peter Manoukian, who, along with the Santa Clara County Public Guardian facilitated the property management’s harassment and abuse of the Markham Plaza Residents, their main target was Heidi Yauman, a quiet and gentle woman who was conserved by the Santa Clara County Public Guardian because of a severe tramautic brain injury from a devastating car accident. After emerging from a long coma, she had to undergo years of rehabilitation and thereby to relearn how to walk, talk and do everything. The Santa Clara County Public Guardian, County Counsel and court officials created forged court documents and fabricated evidence, events and circumstances to cut off the Markham Plaza residents from Palo Alto tenant rights activist, Cary-Andrew Crittenden, and a diverse network of community groups and faith base organizations who had converged on the Markham Plaza Issue with objectives of providing a safety net, moral support and other stabilizing resources for Ms. Yauman and the other residents who’s lives were impacted by the EAH Housing scandal. Some residents could have obviously benefited from grief counseling and were wanting answers into the senseless death of Robert Moss in early November, 2012. a Some leaders called for an investigation by the Santa Clara County District Attorney’s office. Robert Moss, like Heidi Yauman was prohibited from getting the help that he needed. Markham Plaza Property Manager, Elaine Bouchard used the fraud committed in Heidi Yauman’s Eviction to prevent her bedridden neighbor from accomodations pursuant to the American’s with disabilities act. Robert Moss was found dead in his apartment around the first week of November, 2012.
scandal and they scrambled about frantically and desperately trying to prevent federal authorities from the U.S. Department of Justice and U.S. Department of Housing and Urban Development to become involved. for other scandals involving the same network of criminal judges, government attorneys and social workers who orchestrated the EAH Housing Scandal and also, the Federal Bureau of Investigations was investigating the disappearance of approximately 17.3 Million dollars from trusts and conservatorship estates in Santa Clara County Probate Court. Judge Socrates Manoukian interrogated Mr. Crittenden about what he knew about the FBI investigation. 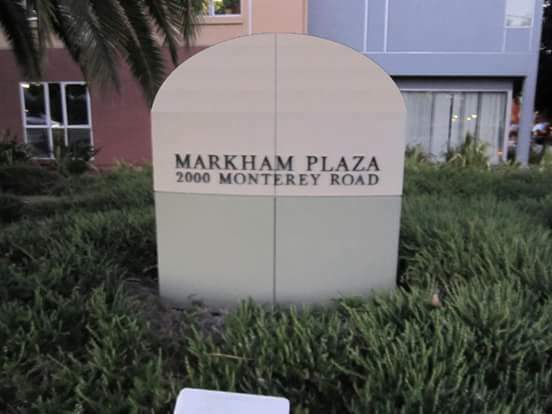 The Public Guardian’s EAH Housing Scandal at Markham Plaza Apartments quickly became the talk of the neighborhood where about two miles South of downtown San Jose near to the Santa Clara County Fairgrounds and “The Plant” Shopping center. This story also generated significant national attention via the internet as more and more people became interested. Throughout Northern California and across the United States, the EAH Housing Scandal became very well known. Many people were, bewildered, shocked and outraged at EAH Housing, and were astonished at intensity of the sick cruelty and vicious harassment by Markham Plaza Property against Heidi Yauman by Markham Plaza Property Management and the audacity of Judge Socrates Manoukian, whose cause for evicting because Mr. Crittenden pleaded on Heidi Yauman’s behalf to Markham Plaza Property Management for the harassment and abuse against her to stop. Heidi Yauman is a quiet, peaceful gentle person who was was conserved by the Santa Clara County Public Guardian after spending months in a coma after a devastating car accident. She spent years in rehabilitation and therapy having to relearn how to walk, talk and do everything. The harassment and psychological abuse against Heidi Yauman by Elaine Bouchard, Markham Plaza Property Manager would have been difficult for anyone to have to endure. How much more so for a person with Heidi’s brain condition having being constantly harassed, humiliated, tormented and terrorised, and forced to live in fear in her own home. She was “evicted” in a fake court hearing by Judge Socrates Manoukian for enlisting Mr. Crittenden’s help pursuant to the American’s with disabilities act to plead for the harassment to stop. A resident has every full right to bring their concerns to management, and if the resident has trouble speaking, they have right to advocate. Ms. Bouchard imposed special lease conditions on Heidi Yauman which did not apply to the other residents and she used this as a weapon to harass Heidi and did everything she could to make Heidi Yauman sick and miserable. Ms. Bouchard threatened Heidi with lease violations for doing simple every day tasks like taking her trash out and would not allow anyone to help her. Then she charged cleaning fees. Deputy Public Guardian Arlene Peterson embezzled funds from Heidi Yauman”s estate to pay Markham Plaza’s attorney, Ryan Mayberry to commit fraud against Heidi. The fraud was labeled “attorney fees”. 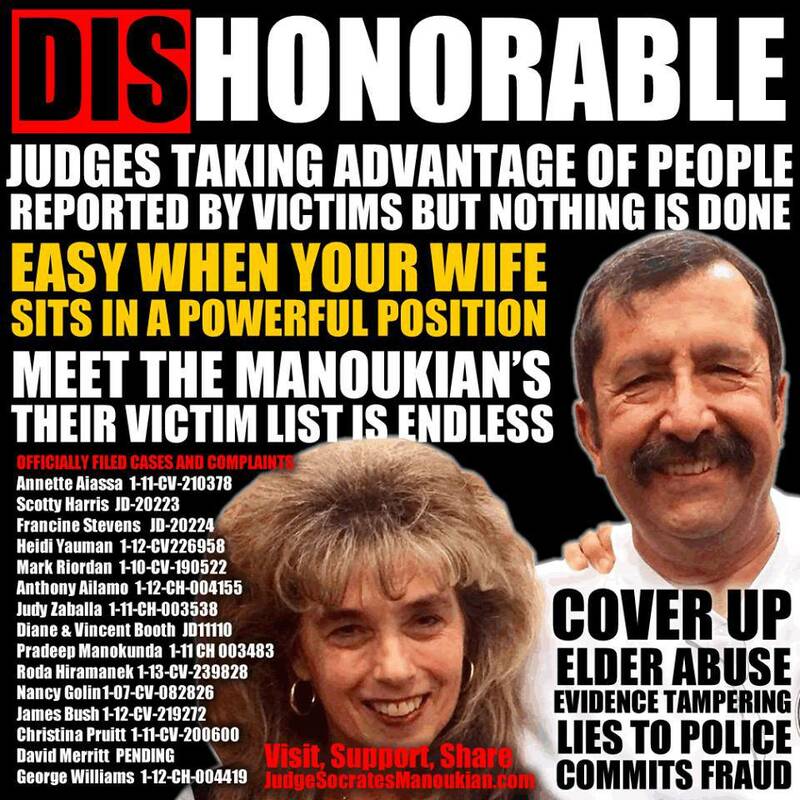 They recruited some false witnesses who issued fake statements in Judge Manoukian’s court room, but none were signed because since the statements were untrue, to sign them would be perjury. Markham Plaza Property Manager Elaine Bouchard then used the same fraud committed in Case 1-12-CV226958 to also deny Heidi Yauman’s bedridden neighbor, Robert Moss accomodations pursuant to the American’s with Disabilities Act. Robert Moss was found dead in his apartment in early November, 2012 at 2000 Monterey Road, apartment 409,Pn Jose, CA. after Markham Plaza Property Manager, Elaine Bouchard used the fraudulent court record she created in case 1-12-CV226958 to deny him accomodations pursuant to the American’s with Disabilities Act. After Mr. Crittenden tried to assist Heidi Yauman in filing a complaint with the US Department of Housing and Urban Development about the sick and hideous way she was treated. The Public Guardian abused their power of attorney over Heidi to shut down her HUD complaint, and to cover up the crimes that they committed. Mr. Crittenden appealed and brought the issue to top officials in Washington D.C. from HUD General Counsel and Inspector General. Santa Clara County Counsel Orry Korb did not want the Federal Government to get involved and he was becoming increasingly uncomfortable with information about his EAH Scandal, the abuse and fraud of Heidi Yauman and Robert Moss’s death circulating all over the internet. Orry Korb sent Santa Clara County Sheriff detective David Carroll after Mr. Crittenden to stalk him, harass him, threaten him and intimidate him. Others came forward claiming that they too had been defrauded by Judge Socrates Manoukian. A pattern began to develop showing that court cases in Judge Socrates Manoukian’s court room had nexus to probate court litigation occuring in department 3 under Santa Clara County Superior Court judge Thomas Cain. Detective David Carroll threatened Mr. Crittenden that he would be arrested if he tried to contact HUD to file a complaint and was told to not send any emails mentioning the crimes that had been committed by government officials. 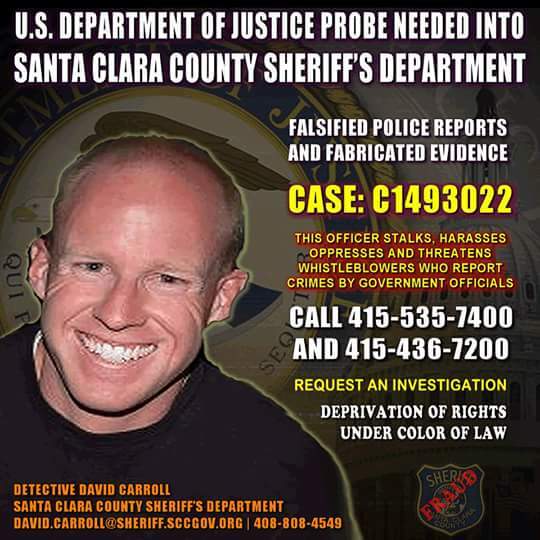 Detective Carroll notified Crittenden that he was under investigation by the Santa Clara County District Attorney’s office for attempting to file Federal complaint about the County’s involvement in the EAH Housing Scandal, which likely led to the death of Markham Plaza Resident Robert Moss. Crittenden was eventually arrested on December 16th 2014 for exposing criminal corruption ring and speaking out against the sheriff’s department harassment against the victims and their families. Crittenden was framed on trumped up charges by Santa Clara County Sheriff Detective David Carroll.